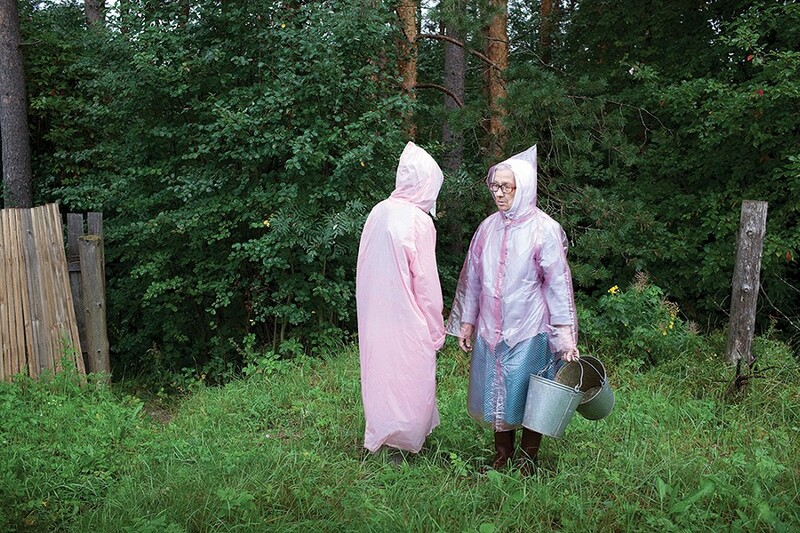 Growing up in Saint Petersburg, photographer Nadia Sablin spent lonely, bored summers in the rural Russian village of Alekhovshchina, visiting her father's family. "In this stillness and time alone, I invented rich magical worlds," Sablin recalls. "Every small event became magnified, insignificant details seemed symbolic, life was permeated with longing for home. I learned to read there—and to imagine." It's no wonder that the locus of such bittersweet memories has become a powerful lens for self-discovery and a recurring focus for Sablin, who immigrated to Ohio at age 12. 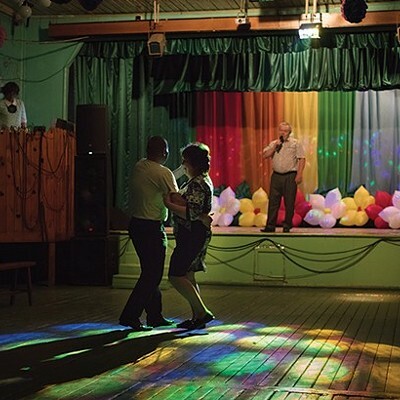 As an adult, Sablin, whose work has been featured in the New York Times, Slate, and the Guardian, has spent 10 summers returning to Alekhovshchina to photograph her elderly aunts, the scenery, and the villagers. In 2015, Duke University Press published Aunties: The Seven Summers of Alevtina and Ludmila. "The aunties stood out even in my childhood, as unmarried, as wholly devoted to their immediate family and unchanging in their habits," Sablin says. 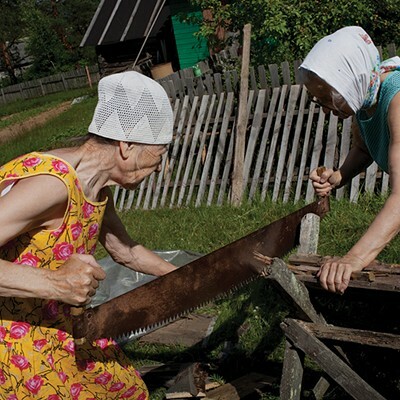 The images from this project are snapshots of the women engaged in anachronistic rural chores—lugging water, ironing brightly patterned fabric, sawing lumber, scything long grass, picking berries. Blending narrative, stylistic, and documentary influences, she manages to create poignant, lyrical expositions on the beauty, silence, and struggle of this remote place. Sablin's photographs have been displayed in solo and group exhibitions across the country, including the Philadelphia Museum of Art, the Southeast Museum of Photography, and the Cleveland Museum of Art. 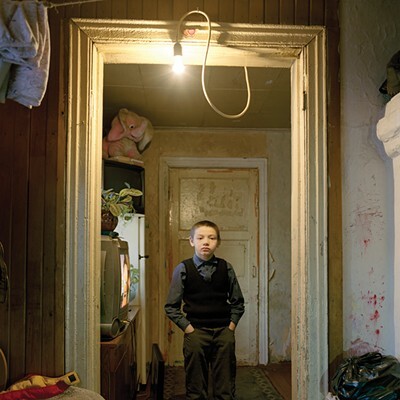 Currently an assistant professor of photography at SUNY New Paltz, Sablin was awarded a Guggenheim Fellowship in 2018 to continue her work in Alekhovshchina. During a year-long sabbatical, she will have the opportunity to capture the passage of the seasons and therefore represent a fuller sense of the rhythm of the village. "There are realities that have been unavailable to me, as my job leaves me tied to the academic calendar," Sablin says. "After 10 years, I have finally been accepted into the community, invited to events and parties, allowed to photograph in intimate spaces. People know me and care about my project. It gives me a whole new level of access, which I didn't have before." Apart from it being your family’s ancestral village, what fascinates you about Alekhovshchina? What fascinates me about Alekhovshchina is its unremarkable nature. It could be any village in Russia—there is no tourist attraction, no especially heroic past, no landmark feature to make it stand out. And in this way, I feel it’s a representation of the whole country. 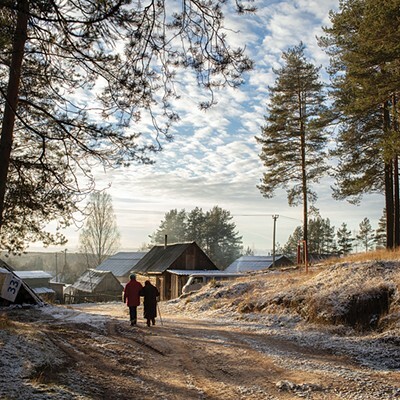 I can look at this place closely to understand how rural Russia functions: what motivates people, how they survive difficulties, what their spiritual life is like, how they treat one another, what they think of themselves and of the outside world. Has your understanding of the place evolved over the summers that you visited as an adult? I have now spent a decade coming back to the village, and from a memory of magic childhood adventures, it has become much more complicated, darker, lovelier. The simpler, unplugged way of life embodied by your aunties and captured by your photographs has all but disappeared in most of the world. 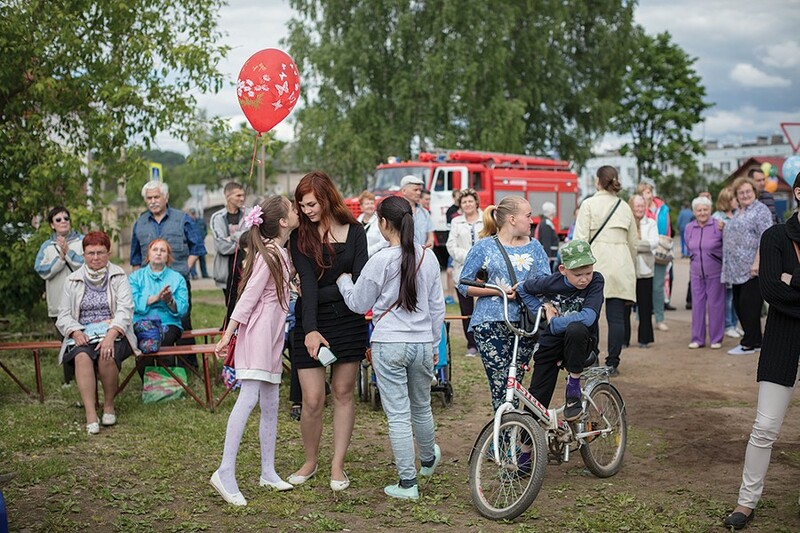 Do you think the young people in Alekhovshchina will carry on their ways? The aunties stood out even in my childhood, as unmarried, as wholly devoted to their immediate family and unchanging in their habits. I once asked aunty Alevtina why she always wore her hair in a braided bun and wouldn’t she like a perm instead (it was the ’80s). Her reply was that everything is balanced in the world and if she cut off her braid, someone else would have to grow out theirs. By struggling with difficult lives (and although it’s visually beautiful, physical labour is never not a struggle), they were taking on their share of universal pain and possibly sparing others. It’s a very admirable way of seeing oneself as a part of the world, inextricable from its fabric—a very different paradigm than the individualism with which I was raised. What do you see as the risk or tradeoff of this way of life dying out? We tend to mythologize the country as many more of us move into cities, but it is an incredibly difficult way of life. It’s also unsustainable in our changing, growing world. We have to find new ways to feed the ballooning city populations in order to survive. As a result, we’re losing whole cultures: languages, communities, traditions, songs, stories. We are losing darkness and silence with our power tools, industrialized farming practices, and our constant connection to the digital realm. As a photographer, you walk around looking at things and people all day long. What types of things draw your eye? There are so many things that draw me: light glinting on reflective surfaces, seemingly incompatible objects coexisting in the same space, beauty, awkwardness, laughter, dark figures on snow, loving touches between people, men with tools, floral patterns, stray animals, roads leading into forests, repeated gestures, fires, sharp edges, magic. The list is infinite. How would you describe your approach to composition and framing? Henri Cartier Bresson said, “To take photographs means to recognize—simultaneously and within a fraction of a second—both the fact itself and the rigorous organization of visually perceived forms that give it meaning. It is putting one’s head, one’s eye, and one’s heart on the same axis.” I have worked my whole career on making this my approach. You have referred to your photos as a “lyrical interpretation” rather than pure documentary—what does that mean to you artistically and technically? It frees me from some tough journalistic rules, and in this way allows me to be more honest about what I see as a flawed, complex individual without any claim to objectivity. My project is as much a reflection of my internal world as external. I think this is true about all works of art, but it’s often believed that photography can better reflect reality than other media. I’m not certain that’s true. In technical terms, this means staging, styling, and Photoshop are not off-limits. Many of your photos are staged portraits. What draws you to this sort of portraiture over “in the moment” shots? I make both staged and unstaged photographs, and often the viewer will not guess which is which. I like to experiment, to try different approaches, to collaborate, to direct, or to observe. It keeps me fluid and interested in what I do. The worst thing for me, as an artist, would be to succumb to a formula; it would be so dreadfully boring. When do you consider a photograph a success? A successful photograph for me is one that makes the viewers feel something and learn something, one that they will remember. How does your practice affect your teaching? Working on long-term documentary projects allows me to keep current, and keep alive the excitement I have for photography. When I teach, I have a well of experiences in the field from which I draw practical advice, examples of successful and unsuccessful approaches, and stories that get students excited about starting their own projects and pushing past their own comfort zones. When I am photographing, I often think about my classes, and I plan my future trips while school is in session. These two sides of my life depend on each other and keep me always looking forward. I’m especially delighted to begin working with graduate students in our new MFA track in photography and related media when I return in the fall.